How do you make a laser cutter whisper? By painting into vintage photographs, Laura Christensen creates altered realities that are so seamless, it’s easy to believe they’re real. 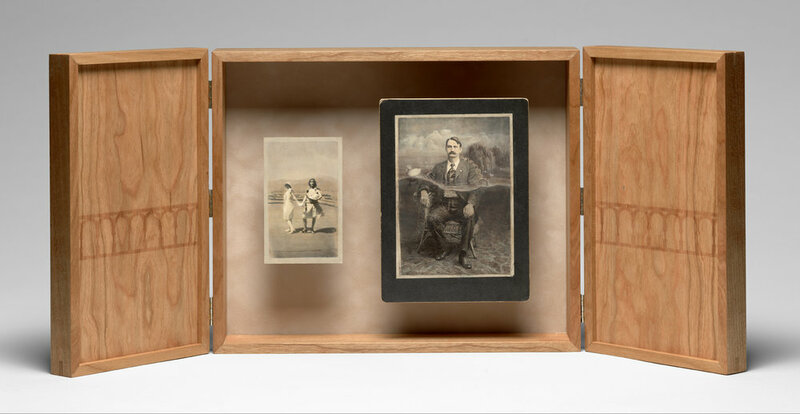 Laura’s paintings are housed in shadow boxes and cabinets she builds for each piece. In Regent’s Park, inspired by Elizabeth Bowen’s short story Tears Idle Tears, Laura wanted to subtly laser engrave a garden fence into cherry panels. An engraving so subtle, in fact, that you can barely feel an indentation. The first step of every project is material testing. We have this idea that because laser cutting is a mechanical process, we can simply enter in a factory setting, and—ta-da—amazing results … not so fast! Laser cutters are incredibly sensitive and any change in material make up, such as the density or color of wood can create different results, especially with subtle laser engraving. Laura’s cherry was lighter than my shop sample. Using a piece of wood Laura provided I did a series of tests, so she could choose the effect that best suited her vision. It’s important that the material provided for testing is exactly the same as the material used in production. Otherwise the final results will not be the same as the test. Most of the artists I work with are not familiar with Illustrator, the vector based program used to create laser-ready files. Not a problem! I can create laser-ready files. Laura sent me with a detailed schematic and a high resolution silhouette (.JPEG) of the design. Laura provided me with 3 pieces of cherry cut to size. Even with the best planning it is always good to have the safety net of extra material. Click on the video above to see how the laser engraved the lightest whisper to create a design referencing a type of garden fence you might find in an urban community park and echoing the haunting quality of Laura’s painted photographs. When it comes to engraving, a whole range of effects can be achieved, including different colors, depths, and edge qualities. Depending of the type of wood the engraved area may turn dark brown (cherry, maple, basswood) or light brown (poplar, birch). Laura Christensen - Regent's Park, 2018. Acrylic paint, vintage photographs, cherry wood, book cloth, and brass.